A comfortable and functional gig bag for your dreadnought. Fender’s F1225 Series gig bag is a wise choice to keep your dreadnought acoustic guitar safe while traveling. 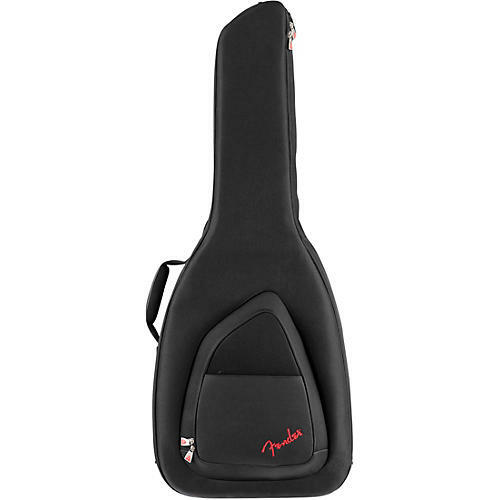 It comes in Fender's iconic asymmetrical instrument shape with a durable outer layer is constructed of tough 1200 denier polyester to protect your precious instrument against impacts without worrying about rips and tears. The F1225's interior is filled with 25 mm padding lined with soft touch microfiber that keeps your instrument secure while avoiding any damage to the finish. It even comes with two adjustable protective neck rests and exterior bumpers to minimize any strain on the instrument while in transit. The F1225 gig bag also comes with a super-padded handle and shock-absorbing EVA padded backpack straps with easily adjustable ladder lock buckles, so you can carry your instrument in a more ergonomically friendly way. Plus, it features plenty of storage space with its large front pocket and zippered backpack strap pocket. The front storage pocket offers space for small accessories and has two dedicated pockets for extra strings, a removable padded tool pouch, three elastic pick pockets, two elastic pen loops, key fob hook and a business card window. Keep your guitar safe and ready to go between gigs.